Abu Dhabi-UAE: 31 May, 2014 – The UAE Embassy in China held a high-level reception for Chinese institutions, government and trade officials and dignitaries in honour of Chairman Wang Chuanfu, founder and president of BYD Co, China and Lifetime Achievement winner of the 2014 Zayed Future Energy Prize. 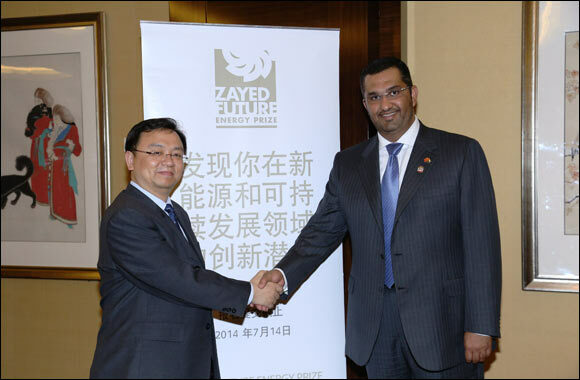 The reception, held in Beijing, was attended by His Excellency Dr Sultan Ahmed Al Jaber, UAE Minister of State and Director General of the Zayed Future Energy Prize; His Excellency Omar Ahmad Adi Al Bitar, the UAE Ambassador to China; Chairman Wang Chuanfu, and senior representatives of Chinese renewable energy companies that demonstrated strong interest in engaging with the UAE and the Zayed Future Energy Prize. At the reception, Chairman Wang was once again recognised for his impact, innovation and leadership in the renewable energy industry, as well as his long-term vision in founding BYD (Build your Dreams) as a 29-year old. BYD is today one of the world’s largest manufacturers of rechargeable batteries and a market leader in electric buses and grid-scale energy storage systems. China is undergoing an important transformation, moving away from traditional forms of power generation and developing a robust renewable energy sector. The country has a leading position in wind power and solar heating globally and enjoys strong government support and investment. One of the world's highest emitters of greenhouse gases, the country has rolled-out initiatives to reduce CO2 emissions by 40 - 45 per cent from its 2005 levels and increase the use of renewable energy from around nine per cent of its current total energy mix to 15 per cent by 2020. The Zayed Future Energy Prize is a US$4 million prize awarded annually to large and small companies, NGOs, high schools and individuals that have made significant contributions to the future of energy and sustainability. In six years, the Prize has rewarded 30 innovators and impacted communities across the world. Submissions for the seventh edition of the Prize are open until 14 July, 2014.